Instant cleanser for face, eyes & lips. Suitable for all skin types. 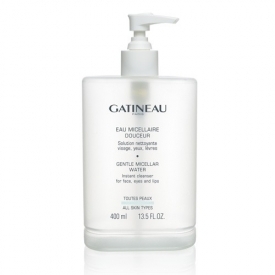 Gatineau Gentle Micellar Water is a universal cleanser/make-up remover ideal for all skin types, all ages and that suits women and men as well. - Thanks to micells, micro-drops that captures impurities. - 3 in 1, it replaces all products usually required during the cleansing step. - With no added parabens, no alcohol, fragrance-free, no dyes, no silicones, it provides an optimal tolerance to all skin types, including the most sensitive ones. 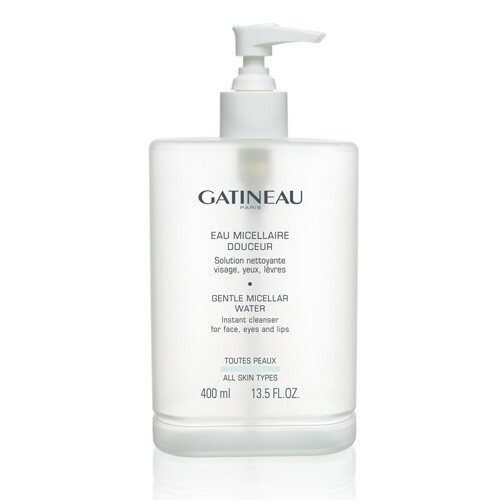 Ideal for: For a night out straight after a day of work or after a workout session, total must-have after a heat stroke or stress, Gatineau Gentle Micellar Water refreshes the face and the skin before makeup touch-ups. - Face, eyes and lips are perfectly cleansed and/or all traces of make-up are removed. - Fresh and radiant, the skin looks very healthy. It is ideally prepared to receive the following daily routine. 81% of women were seduced by its texture and its cleansing efficacy and 84% of them by its softness during make-up removal. It’s not a shortcut but brilliantly designed for girls on the go! Unbelievably effective 3-in-1 cleansing water. Cleanses, tones and moisturises in one application. Does not irritate or dry out the skin. Contains no chemicals, alcohol or fragrance. Simple, attractive large size bottle with dispensing pump preventing over use of product. Excellent value for money. This is a cult product by Gatineau and perfect for girls on the go or those that have a restricted budget for their skincare. Micellar Water is a fantastic 3-in-1 cleansing routine that cleanses, tones and moisturises all within one product. This cleanser contains n0o chemicals, alcohol, colour or fragrance and is remarkable at removing all makeup including eyes, lips and face. It is a pure clear lotion that feels silky smooth on the skin. Simply cleanse with cotton pads and you will see the makeup and dirt just melt away. Your skin feels instantly cooled, refreshed, calmed and toned and you will not believe how soft and hydrated you skin feels after use. This product is excellent for stressed, sensitive and damaged skins although it is equally as effective for any skin combination. You only need a tiny pump of toner for the whole face so the big bottle is excellent value for a salon grade product. I adore this product and use it regularly when I do not have time for the full cleansing routine. This is not a ‘shortcut’ product; it is specifically and brilliantly designed for girls on the go! "It’s not a shortcut but brilliantly designed for girls on the go!"